The new Bitters and Twisted venue is something a bit different. They've got cocktail bars, quirky pubs, a gin parlour and now- a theatre restaurant. The food offering at The REP Birmingham has been through several changes and has now hopefully settled on Marmalade from Bitters and Twisted. Edd and I visited for breakfast and were impressed with the quality of the ingredients and the cool design and furniture. We knew we had to go back! We decided to pop along for lunch on Saturday. It was really busy when we walked in but most of the diners were eating before the matinee so we were able to get a lovely table . Our friendly waitress handed us a cocktail menu and daytime food menu. Bitters'n'twisted are known for their cocktails so we knew we were in for a treat. 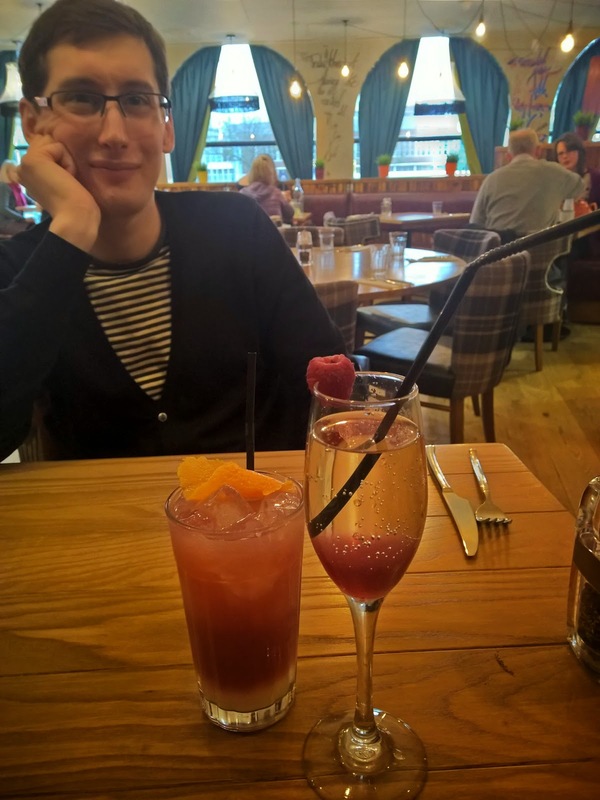 Edd chose a Pomegranate Collins (Gin, lemon, sugar, pomegranate juice) and I had a Marilyn Monroe (Vanilla vodka, Chambord, Prosecco). Edd loved his fruity drink and I enjoyed the tangy taste of mine. It came with a straw but I found it nicer drinking it straight from the flute. I've got my eye on the rest of the cocktails too- especially the signature Marmalade Collins. 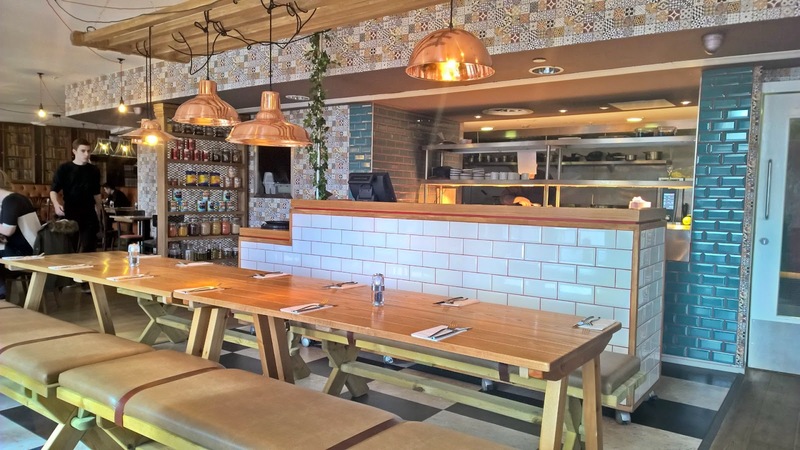 The daytime menu is pretty substantial, with sandwiches, small plates and main meals available. I never go for sandwiches, but the couple at the table next to us did and they looked excellent- really good bread and generous helpings of the fillings. 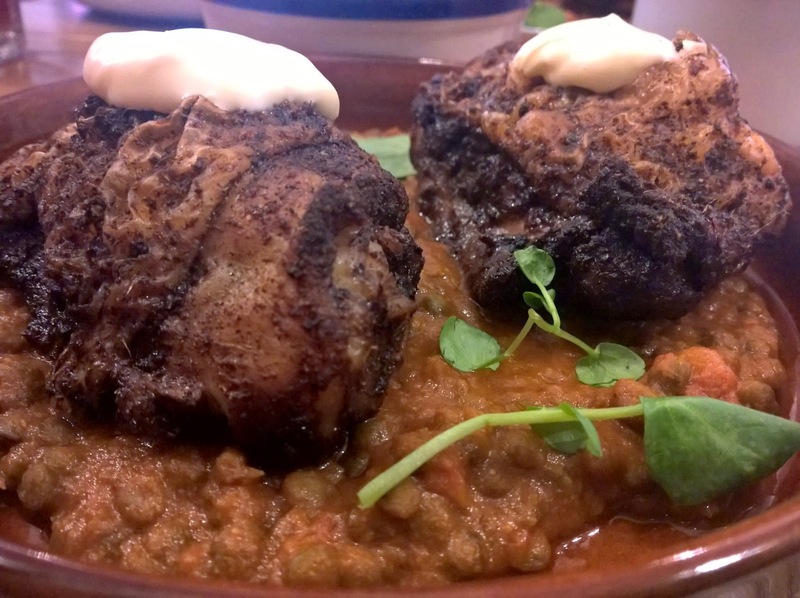 I went for Baharat Chicken Thighs with Lentil Dahl with a green salad. 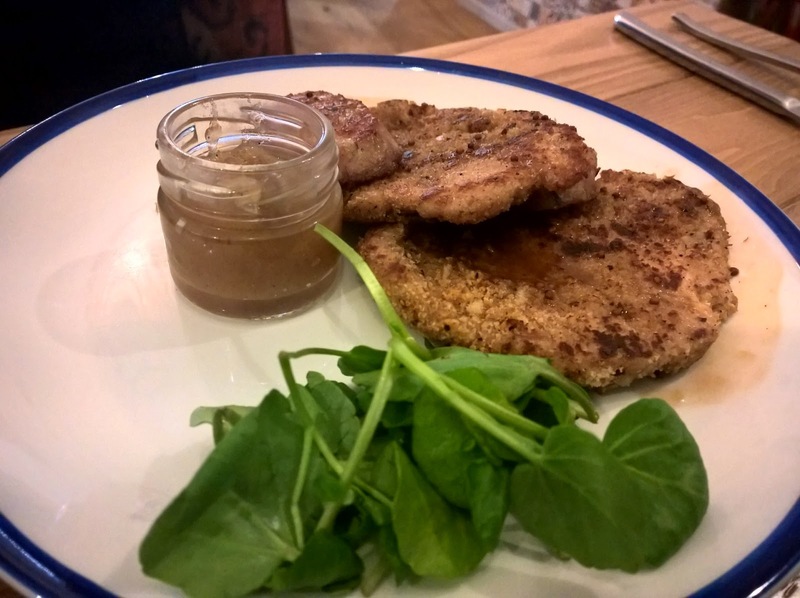 Edd picked Pig's Cheeks Schnitzel with Hogan's Apple Cider Jam and White Pudding plus some chunky chips. The waitress kindly brought us some extra plates so we could share everything else. Baharat is a Middle Eastern spice blend and it was perfect for the chicken thighs which were generously sized and beautifully cooked. The Lentil Dahl was gently spiced and flavoursome. A dollop of Aioli on top was a perfect accompaniment. 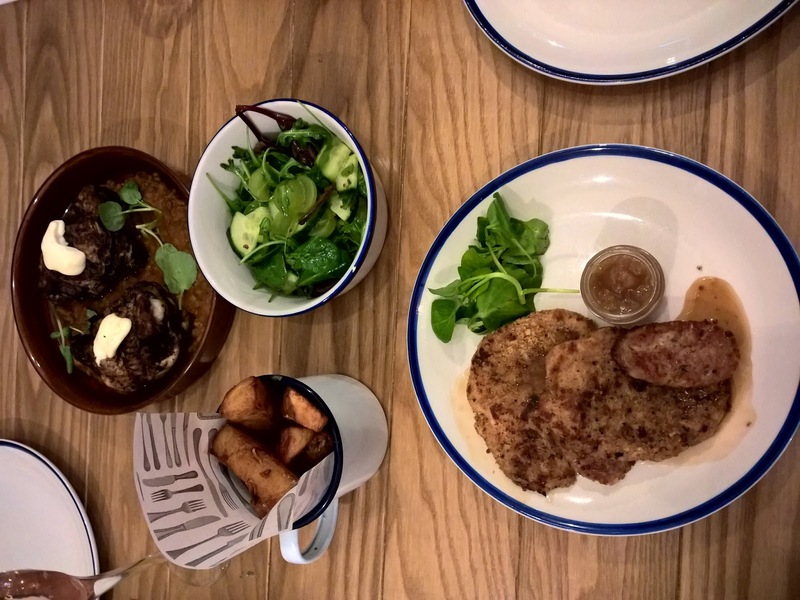 Edd's Schnitzel was nice enough and I adored the white pudding with it- that was the star of the show. Although there was nothing wrong with it, the dish didn't blow my mind and seemed to be lacking something compared to my flavoursome chicken thighs. 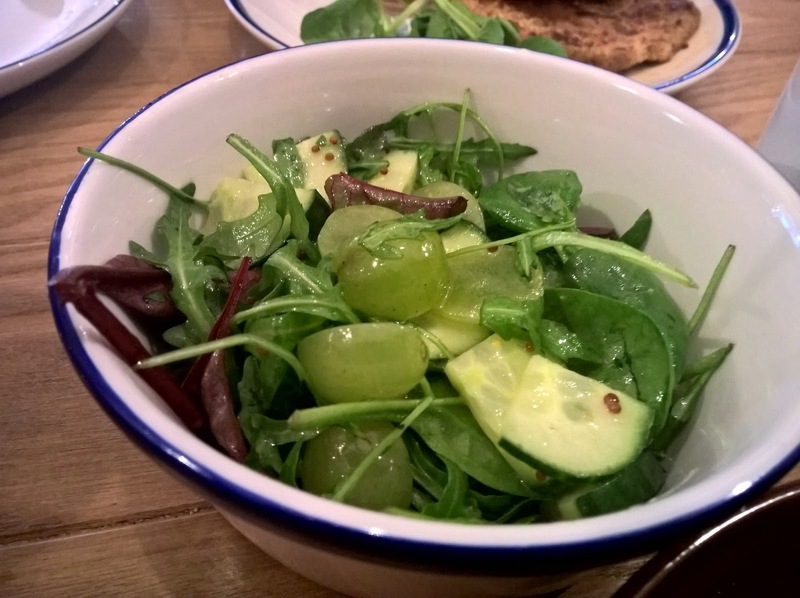 The salad contained grapes and cucumber as well as leaves and this made it a lovely fresh side dish. 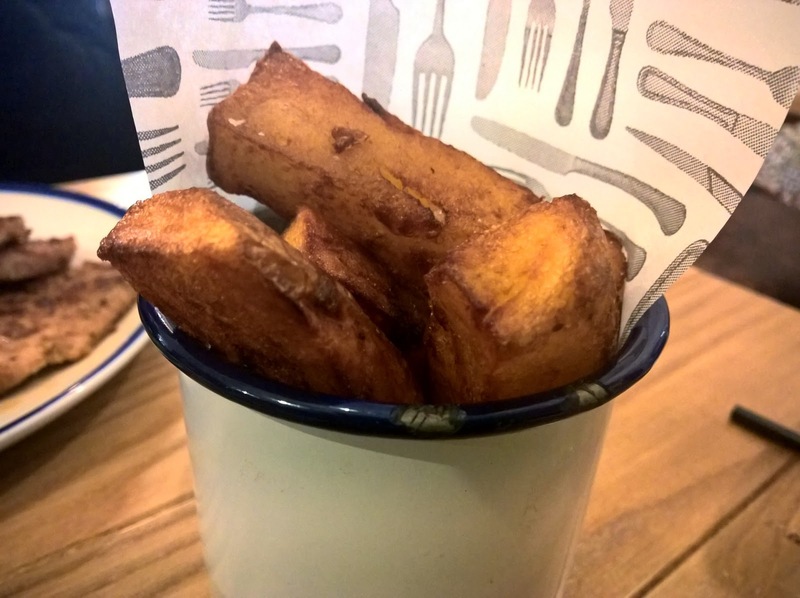 The chunky chips really were chunky! I love chips like that, you could tell the potatoes were really good quality. Although we ordered small plates, we found them very filling and plenty for lunch- they are a lot bigger than tapas portions. I'll definitely be back to try the evening menu. I like that Marmalade are doing something a bit different, with influences from around the world. Imagine how fabulous it would be to have a tasty dinner at Marmalade and then watch a show at The Rep. I'll be interested to see how they grow and improve as they settle into their new venture! I paid for my meal myself and Marmalade did not know I was reviewing.